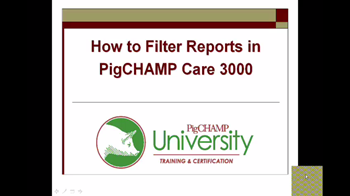 In PigCHAMP, it's easy to filter reports to select for specific information - for example, to select report data for only parity 3 sows in your herd. Step by step instructions are found in this youtube video. You can also find more information on specific filtering options by visiting our FAQ page and searching for "filter". Mark your calendars for the 2015 World Pork Expo, which PigCHAMP and Farms.com are proud to support as Silver Sponsors again this year. We will be exhibiting in the trade show and can be found at booth 577 in the Varied Industries Building. 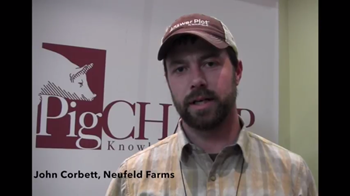 Watch this youtube video to find out why John Corbett of Neufeld Farms in Alberta, Canada uses PigCHAMP mobile. Have your say! PigCHAMP is looking for customers to record testimonials to go on our new PigCHAMP.com website, due to launch in early May. If you would like to share why you love using PigCHAMP Reproductive, Grow-Finish, Mobile or Online, simply contact info@pigchamp.com.